I don't even know what else to call this...so I'm calling it cutting a word out of a shape in Silhouette Studio. I posted a picture of a quick and easily baby onesie I made for a friend (so don't yell at me for already posting St. Patty's day crafts...it's her fault) and you all went crazy...so I thought I'd share a really easy tutorial on how to make one yourself. This is seriously like a 5 minute project...so you got this! In Silhouette Studio, find your shape and type out your word. 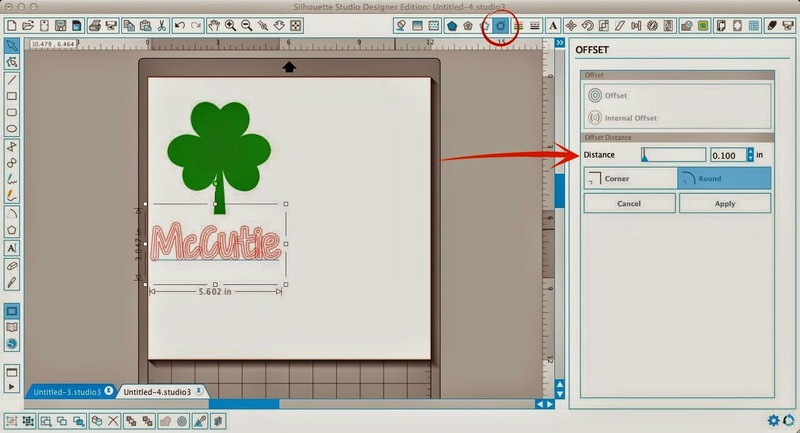 Select the text and then click on the 'offset' tool. Pick "offset" and decide on a distance. I went with .100, but it's really up to personal preference! After you have your offset, use your mouse to drag it away from the original text and position it over the image. Keep the original text, you'll need it. 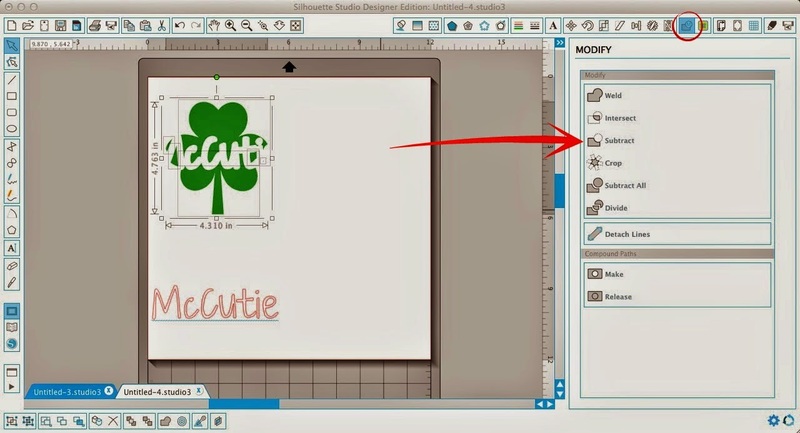 Select both the offset and the image and from the modify window click "Subtract." If you need to resize the designs, be sure to select them both at the same time and resize so they stay in proportion. 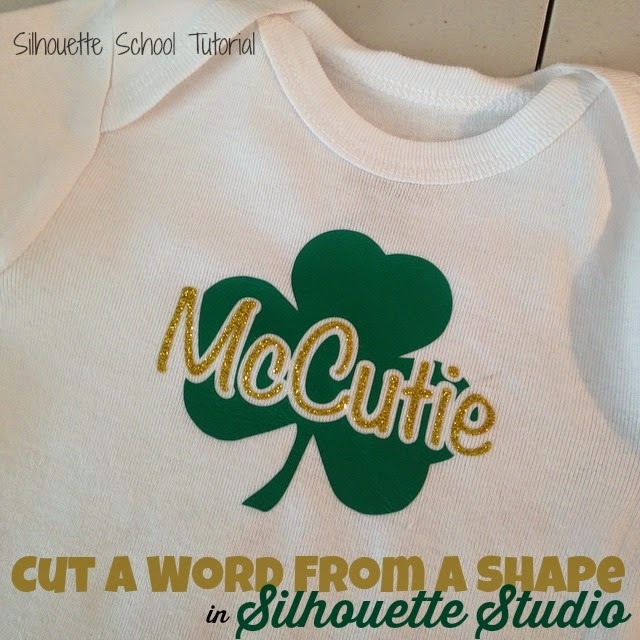 To cut on heat transfer vinyl, mirror your images and cut the two pieces out. If you cut on glitter heat transfer vinyl (I get mine from Expressions Vinyl), as I did, it's best to put it down second and adhere the smooth htv design first. That tiny bit of 'height' on the glitter htv can prevent smooth htv designs from fully adhering to the shirt. I told you this was a quick and O'Easy project! Love this quick and easy. Do you mind sharing the name of the font used?? I just used this post to make shirts for my daughters. Thank you so much! Looks brilliant on wine glass & mason jars. Thanks for the tutorial. Do i need to trace my words before i am cutting them out of the vinyl or in general? I am trying to make a shirt that says wild flower.... i traced the text (FMI when I am using the trace tool what trace style should i use?). i used cooper black as my font which was already loaded in my softwear what am i doing wrong.